I am a student at the Australian National University. I am working on a PhD in mathematics under the supervision of Scott Morrison. My research is in category theory and operator algebras. In particular I work with fusion categories, subfactors, and algebras constructed from topological groupoids. My thesis involves classifying pivotal fusion categories generated by objects of small dimension. This research is kindly supported by the Deakin PhD Scholarship and an ANU Supplementary Scholarship. Uniqueness Theorems for Steinberg Algebras. A Field Guide to Categories with A_N Fusion Rules. The Brauer-Picard Groups of the ADE Fusion Categories. Ideals of Steinberg Algebras of Strongly Effective Groupoids, with Applications to Leavitt Path Algebras. joint with Lisa Orloff Clark, Astrid an Huef, and Aidan Sims. In press at the Transactions of the American Mathematical Society. November 2015, Classifying Quadratic Fusion Categories , Kioloa workshop. 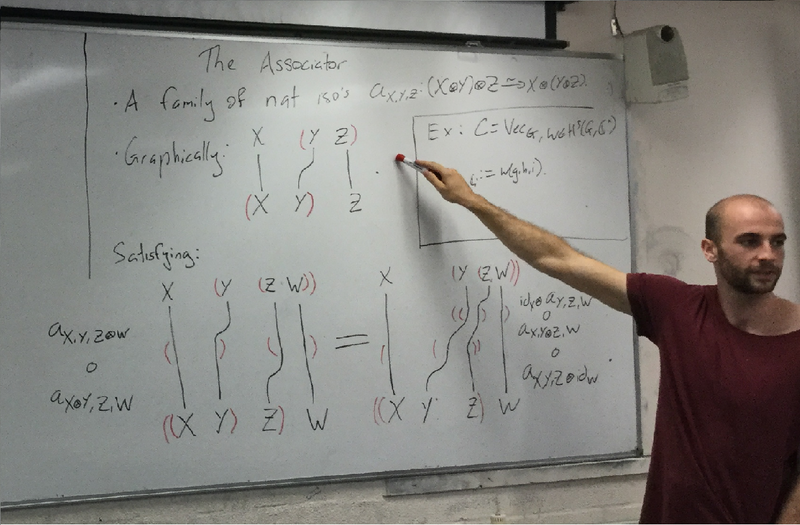 March 2015 An Introduction to Topological Groupoid Algebras , ANU MSI graduate seminar. October 2014, The Ideal Structure of Steinberg Algebras , honours talk at University of Otago.